Reminders For the New School Year (Part 3) ~ Seeking – God's Grace ~ God's Glory! What is the difference between the things of the world and the things of God? What separates the kingdom of the world from the Kingdom of God? The things of the world are visible, easily seen, tempting and influencing and aiding our lust for these things. Education, knowledge, work, and money are the stepping-stones to satisfying the lust of the flesh, the lust of the eyes, and the pride of life. In these the adversary of our souls does his work and rejoices with us whenever we can afford (or buy with a credit card) a new product that we have seen advertised. If purchases are just to fulfill our desires he can claim us for himself and the kingdom of this world. In the Sermon on the Mount (Matthew 5-7) Jesus speaks of the reality of God’s law for humanity; the essence of true life as God created it to be. He interpreted God’s commandments as He meant them to be understood and practiced in this life. Jesus was revealing to the common people of His day a picture of successful living. He was here to transfer the written law from stone and paper to the human heart and life. It is here that He emphasizes what God’s children should be seeking first; showing that their desires should be for something higher than this world offers, because our Father has already planned these things for us. He points out a specific difference in the life of the masses compared to life in the kingdom of God. The world’s concerns are only for the things of this world, and not for the things that God wants for us. Jesus told His disciples that it was the Father’s pleasure to give us the kingdom; not just part, but the whole. All this He promises for our eternity with Him, and prepares us for it here. The word “seek” in the New Testament means to look for something that is hidden. 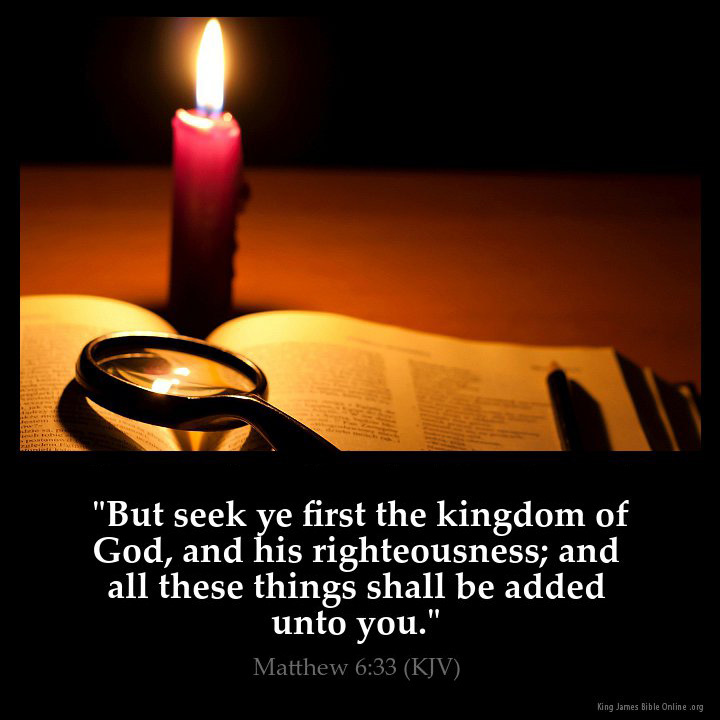 To seek the kingdom of God and His righteousness is to desire and continue to seek until we find what is hidden. In Part 2 ~ Asking ~ we saw that we are to ask for the Holy Spirit and for wisdom. With the Spirit of wisdom we have the guidance to seek the kingdom of God and His righteousness. When God created us in His own image He created us not just as physical beings, but also as spiritual beings, with needs for both. When we seek only what we need physically we are still poor and needy. We need bread and water and clothing and shelter, but the physical things are temporal. If no other life were promised to us these would be all we needed and would be enough, though they would have to be continually replaced. The words that proceed from the mouth of God are given to us by His Holy Spirit. The Holy Spirit, which inspired the words of God to be written brings us to His Word, The Holy Bible, and guides us to find there the kingdom of God and His righteousness. The things of God and His kingdom are promised for us here and also for another life which is spiritual and everlasting, though now unseen to the human eye. They are eternal, never wearing out, never needing to be replaced. Even as all wisdom and knowledge are hidden in Jesus Christ, so is the righteousness of God. We cannot earn a degree in righteousness; we cannot work or purchase it. We must, in faith, receive it as the Father’s gift to us and live in humility, praise and recognition of what Christ has earned for us. Righteousness is the law of His kingdom, and found only in Jesus Christ His Son whom He sent to bring His kingdom to earth, and through it to gather His people to Himself, for now and eternity. Christ is the King, who will reign until He has put all the enemies of this world under His feet, including all our desires of the flesh and for this world. He came to separate His people from the world, to prove those who belong to Him. He came, lived to fulfill all righteousness ~ the law of the kingdom ~ and to give His righteousness to us, who by His Spirit seek and find what He desires for us. “Seek those things which are above, where Christ sits on the right hand of God. A formal education takes us through fourteen years of learning how to seek and acquire the kingdoms of this world. College and extended training adds more ability to fulfill the American Dream. How many years do we seek God’s word to find His kingdom and His righteousness, and to praise Him for providing us with all that we need for this life and for eternity with Him? Sometimes we may begin a search for something, and because it is not easy for us to find, we give up and settle for less than our heavenly Father has prepared for us. 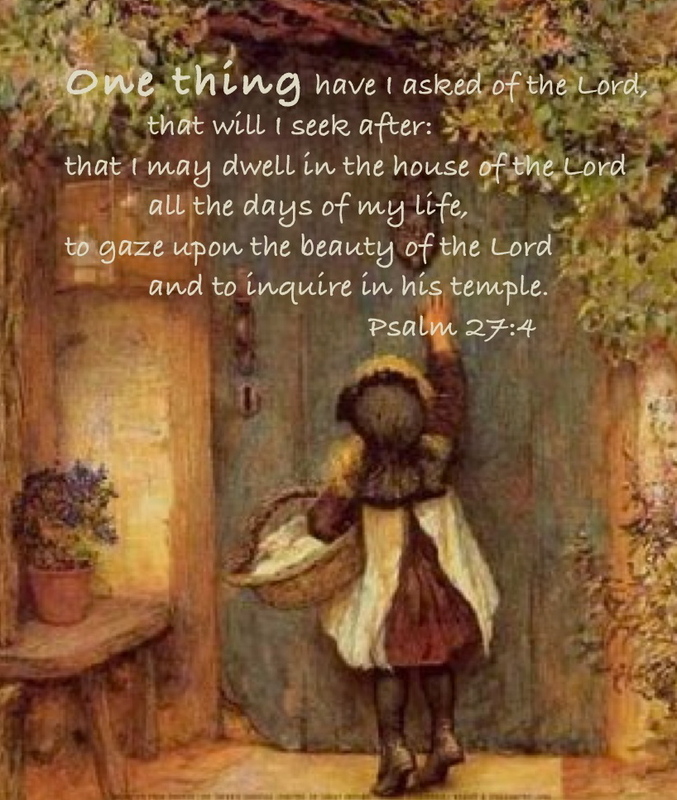 When Jesus tells us to ask, seek and knock it is with this in mind. He knows our tendencies to look for the easy way of this life, and thereby miss the greater life of the spiritual things. We ask in prayer, we seek through His Word, both of these in the power of His Holy Spirit. When by His Spirit He begins to teach us and to reveal His kingdom to us He works a greater desire in us to earnestly seek Him and all that He promises in His Word. We knock when with the whole heart we desire His presence, His power and wisdom above everything else, and at whatever the cost. He reveals a kingdom and a life that is greater than any we have known here. Our thoughts and desires are changed. We begin to hunger and thirst for His righteousness, and knock at the door of His heart until He opens the doors of heaven to us. Gracious Father, I have but one heart, one desire, one life here and forevermore. You have made it a heart for yourself. Fill it with your Spirit, Holy and Righteous. Transform me by the renewing of my mind through your word, and conform me to the image of Christ, your Son. Write on my heart, every thought, every word, and by your will work in me every deed that proves I am yours, a child after your own heart. In Jesus’ name I pray. Amen.